And you thought it is just Magic ! 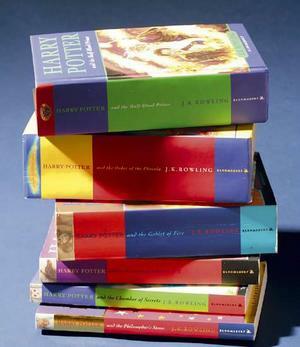 When I think of Harry Potter, the first thing that comes to my mind is – Thank God J.K Rowling had this amazing idea. She gave my childhood a gamut of memories and emotions. There are many many who hate Harry Potter series. I can surely say – either they have not read any of it or seen the stories just through the movies. Because, anyone who has read them will always know – that the literally BEST SELLING FICTION series has absolutely nothing to do with magic. Magic in Harry Potter is like that beautiful background music in a play. You realize its absence only when it stops. Just, when it comes to HP, the magic never stops! When not weaving magic through the wand waving, Rowling weaves magic through the beautiful emotions she has so aptly portrayed in the series. Every time Harry fought Voldemort he was alone. There are some battles in life where it is just you and the opponent. You may have had as much help ( and you should appreciate it) as you needed, but the last step you have to take. No one else is going to do it for you. You have to fight your own battles. Harry never saw his parents. His godfather died when he had just started growing on him. His best friends died. But the battle continued. And he won. Rowling appears to be a believer in the Karma Yoga. Like I do. No matter what happens in life, what situations you face, you have to always do your duty. In the battlefield of life there is no backing off. Can you please go ahead and say Gita was just a piece of magic? If not, even Harry Potter isn’t a piece of riff raff ! I have always been enchanted with the mirror of Erised – which incidentally is Desire spelled backwards. Absolutely loved the concept of ‘being able to see your normal reflection if you are the happiest person of the world’. But more than that, I was glad Harry could fight the temptation of losing his head to the charms of the mirror. I saw inspiration & perseverance. Rowling helped to be inspired at the tender age of 8. Rowling taught me that ‘our most desperate desires do nothing apart from wasting us’. No one else gave that lesson in a better way. Dumbledore – the man who taught me the value of intelligence, hard work & choosing the Good over everything else in life. He taught me that importance of forgiveness, second chances, of complete souls, of love. Most importantly, he taught me how to value fellow beings. Rowling’s words through Dumbledore “Don’t pity the dead Harry. Pity the living. And above all, pity those who live without love.” They spell a life long lesson for me. Snape ! My favorite character (I hated him till 6th part; like many others). He taught me the value of profound love. A candid confession with candor I make – if I fall in love, it would be like the way Snape loved. A lesson I learnt when I was 17; that which many adults seemingly fail to understand. As much as I try, I cannot captivate into words the plethora of emotions that Snape’s love story kindles in many a Potter fans. Here my words deceive me. The most important lesson that I had came through Voldemort. It is – when you have a dream, relentlessly pursue it. Do what it takes to achieve it. But, also remember that if the achievements have come while you were on the path of evil, you will meet a dead end some day. May be you live 10 years or 50 years with the evil. But ultimately, there will be an end. There is no such thing as immortality of mortals. Yes. Immortality exists. But only through your deeds, ideas, thoughts. While my life’s foundation was being laid, I learned that there is much more to life than power, ambition and success. There is love, friendship, respect, trust & a strong reason between good and evil. And you thought Harry Potter was all about magic! It makes my belief even stronger – never judge a book by its movie or cover. True it is fantasy fiction. But it taught me more about life than any other thing could ever do. There were / are people who did not like the way the book ended. Looking out for some important deaths were you? I am perfectly happy with the way Rowling ended it. Because, she has left so many loose ends. Many places the book could start again. And I would be the same enthusiastic reader that I was 11 years ago. And I would love nothing more than a book on Snape’s story. It would a worthy read. Thank you Joanne Kathleen Rowling for giving me a better childhood . Rowling did mirror herself in dumbledore. A lot of wise words from him, i have to agree.